Note: To log in and manage your product & OAuth Client, use Go to Console in the upper-right or visit console.developers.nest.com/products. The Works with Nest Store provides a platform to market your product, grow your user base, and show your customers how easy it is to connect your product with Nest. Note: For a product to be in the Works with Nest Store, it must first pass client review and marketing review. Only the locales that you have localized the permissions descriptions for will be available for selection on the Works with Nest Store tab. 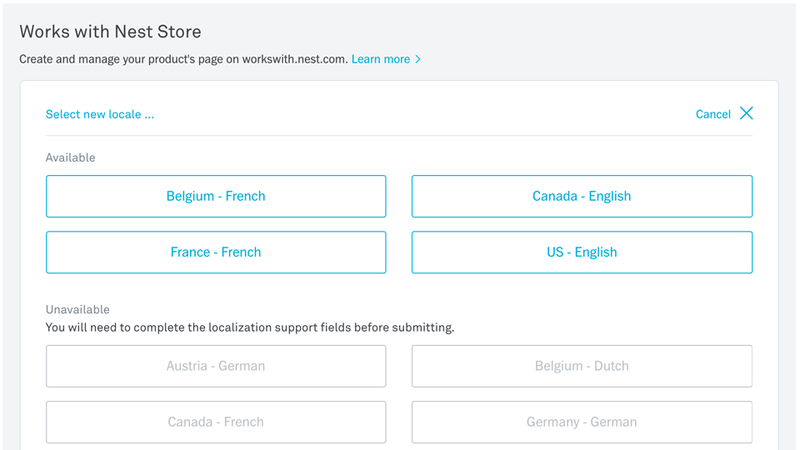 Note: If your product is selling in a country other than the US, and you want your product to appear in that country's Works with Nest Store, you must add localized product information. If a locale is grayed out (unavailable), that means the permission descriptions for your product have not yet been localized. After you complete and save the product information form, you can select additional locales and load localized product information for those countries. You also have the option to clone the form information from an existing locale you have completed. To load additional localized product information for the Store, first add that locale on the Localizations tab. Your integration is considered available in a country if the end consumers owning your products and related Nest products can activate the Works with Nest integration using your app in the country, regardless of where they bought the product. Product A is sold in the US only, but the app features a Works with Nest connection link in Germany. The consumer who carried your product from the US to Germany can therefore activate the integration, which is then considered "available." Product B is sold in all countries, but the US local version of the app does not feature a Works with Nest connection link. Consumers in the US cannot activate the integration, which is then considered "not available." The information you add to the form is used to create the product details page in the Store. You can upload one to four images to the Works with Nest Store. The image order in the form defines how the images are presented. To rearrange the image order, select an image and drag it. If you don't have a hardware product but you do have an App or service, we provide some device "shell" assets for download. These assets enable you to make screenshots for your Works with Nest entry. The collection includes mobile, computer, Apple Watch, and tablet shells. You can choose the best interface for your product and then place your UI in the shell. Keep in mind the following guidelines and requirements. Show off your product with a video (optional). To include a video, enter your YouTube video URL or just the ID. For example, you can enter the full URL: https://www.youtube.com/watch?v=OT_GLh5b07E or just the ID: OT_GLh5b07E. Tell your users about your product. Add headline text, 140 characters max. For example, your headline might say: "ACME Smart Light Bulbs light up your life". Key Point: Headlines that inform and promote your brand personality will be more effective. Tell your users about your product. Describe your product and its benefits in 2000 characters or less. Say what your product does and how it Works with Nest. This information should build on the functionality that you used when you submitted your product for review. Be aware of your audience and write descriptions that your users might be interested in. Be sure to include your product benefits - when a potential customer can easily see how your product helps create a more thoughtful home, they are more likely to be interested in your product. Your marketing landing page should include the features of your product, how it works with Nest, and where potential customers can purchase your product. Your marketing pages are usually targeted for two audiences, potential and current customers. Potential customers are looking to build a thoughtful home and are considering whether to purchase your product. Current customers have already made a purchase, and are looking for more detail about how your product works with Nest. After your product passes client and marketing review, be sure to include the Works with Nest Badge on your site - you've earned it. This is a link to instructions on how your users can connect to Nest. Typically this is a link to your support site, where people who own both a Nest product and your product can find information on how to set up a connection. Note: Step-by-step instructions with screenshots tend to be more successful and reduce further customer support issues. Select the platform(s) and minimum supported version(s) that your product supports. The Works with Nest Store supports multiple variants of a product tied to the same client. For example, perhaps your product ships in multiple colors, and they all need to use the same client for authorization. Note: Use the Name and Description fields to differentiate each variant of the product. For example, put the color of the product variant in the Name field. Each variant appears as an individual entry, with its own set of locales. After you've loaded your product information to the Store, submit it for review. Note: Each locale within each product variant must be individually submitted for review. During this time, we'll use the Store editorial policy as a guide to make sure your product marketing information meets our requirements. We'll respond with feedback or approval of your request within 5 business days. We might ask for more information, so be sure to plan ahead. As the review progresses, your Works with Nest Store submission status will change.